When Derek's Dad Got the Bird! We've a bumper post bag in this issue. Wilfred Harrison writes of his family's "fish and chip shop - chip 'oil - on the left-hand side of Heptonstall Road, Hebden Bridge, where it meets the top of Bridge Lanes. Up the side was a flight of steps leading to a square of houses called Sunny Bank but otherwise known as "Solomon's Backside!" On the other side of the chip shop was a well, ice-cold even in summer. There was a cottage, then the Fox and Goose, and travelling a little higher up, on the opposite side of the road and up three steps, was a clog repairer known as "Jack Clogger," whose teeth were black through holding nails in his mouth." 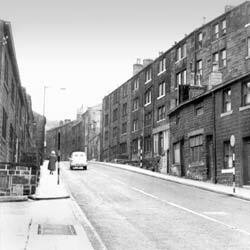 Code no AT316 Bridge Lanes, Hebden Bridge, leading up to the junction with Heptonstall Road, when the area was still heavily populated - and folk no doubt flocked to Harrison's chippy! ALGC. P. and M. Marshall, of St Bees, Cumbria discover an old recipe for Easter-ledge pudding almost identical to the Calder Valley version except that all the ingredients are boiled together in a muslin bag. Sure to tickle the taste buds! "James Speak, Alice Longstaff's father, was the mainstay at Blakedean Chapel. He walked from his home at Learings to preach and play the organ. His father before him also preached there. There was a large portrait of James's father hanging behind the pulpit. Blakedean Anniversary was held on the first Sunday in August and was, as I remember, very well attended. People walked over the moors from Worsthorn, Burnley, Oxenhope and Haworth for the service. A tea was provided, catered for by Mrs Horsfall of Slack Top." 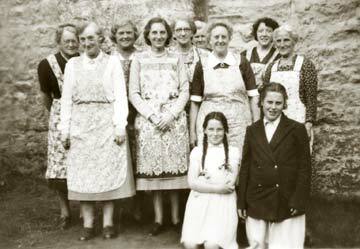 Code no CT184: Blakedean Chapel is fondly remembered by Mrs Ithuriel Mitchell, pictured with fellow tea ladies around 1950. Left to right, Edith Farrar, Sarah Greenwood, Anne Hartley, Ithuriel, Mrs Greenwood, Mrs Thomas, Cis Greenwood, unknown and Clara Spencer. The girls at the front are, left, Mary Speak and Shirley Franklin. Criticism from H. M. Harrison of Heptonstall, leaves' editor Issy Shannon with egg on her face! "I refer to the article about the chicken industry in Mytholmroyd (issue 9). In the photo purporting to show chick sexers at Thornber's Hatchery there is not a chick sexer to be seen. In fact the photo was taken in the incubator room and shows the chicks being taken from the incubators, boxed and sent down the conveyor belt in another department. The photo supposedly showing two Thornber employees delivering a batch of chicks to Manchester Airport in fact actually shows employees from the Thornber Hatchery at Twyford, Berkshire, delivering chicks to Heathrow, London. Oops! But keep those letters coming, complimentary or otherwise, says Issy. Read the full story in Milltown Memories, issue 10. If this or other stories stirs a memory, we'd be happy to know - send us your memories and comments.